If Las Cruces had an astrological sign, it would certainly be Gemini, those very different twins residing in one being. If Las Cruces had an astrological sign, it would certainly be Gemini, those very different twins residing in one being. Spring winds sandblast skin and have launched (at least) a thousand hats, but subside to tranquil breezes that ruffle satiny, amber petals of Mexican poppies erupting from desert slopes. An horno-hot sun dominates summer days before giving way to cool evenings ideal for stargazing; winter ice and occasional snow accumulation usually melt quickly in the mild climate of southern New Mexico. But in autumn, my Mesilla Valley community shakes off its dual identity to achieve perfect balance and abundance. We celebrate the harvest and our cultural diversity in an extended season that paints our varied landscape with red chile, purple asters, snowy fields of cotton, and golden cottonwoods. New Mexico State University students migrate back, turning us into a college town again. There’s much to adore here, just 45 miles north of El Paso, Texas, and Juárez, Mexico. Our proximity to these borders informs the identity of Las Cruces, at 150 years old a relatively recent settlement along the Camino Real. Mexican traditions and Spanish saints infuse our culture, and the city’s cowboy and farming roots are alive and well. I live near the city limit in a house surrounded by farms, where irrigated rows of vegetables strut toward the dormant volcano of Picacho Mountain. Desert and river critters pass through and sometimes raise their young nearby, and my friends nod patiently to the endless litany of my sightings: coyote, fox, roadrunner, beaver, javelina, hawks, great horned owl, quail, the cutest little line of a mama skunk and her babies, as well as the rare rattlesnake that freaks me out. I am obviously fond of a hometown that’s as friendly and unpretentious as an old pair of Levi’s (which are, by the way, perfectly acceptable dress anywhere in this laid-back city). We’re growing at a healthy rate—Smart Money magazine recently recommended Las Cruces as a desirable retirement locale, for its low cost of living and great golf courses—and this population influx brings new diversions to add to old favorites. As a confirmed Chihuahuan Desert rat, I am faced with the blissful dilemma of many attractive choices. A revitalizing hike to a seasonal waterfall, or a trip to a photography exhibition at the Las Cruces Museum of Art? Sipping sauvignon blanc at a local winery, or photographing a dramatic thunderstorm racing across the landscape? A refreshing dip in a pool, or some of the best Mexican food on the planet? All this from someone who once declared the town “a whole lot of brown,” when my family moved here from the California coast when I was 13. Mesilla’s village limits nudge up against ours, and we like to claim our charming neighbor as our own. Visitors on Preciliana Sandoval’s La Morena Walking Tours (575-647-2639) get the inside scoop on Billy the Kid, the ghosts in the Double Eagle restaurant, and the late Katy Griggs, who founded beloved traditional New Mexican restaurant La Posta in 1939 (www.laposta-de-mesilla.com). We catch indie flicks at the Fountain Theater, built in 1905(mesillavalleyfilm.com) ; enjoy cappuccinos and live acoustic tunes at the Bean Café(thebeanmesilla.com) ; shop in century-old buildings for Native American jewelry at Silver Assets(silverassetsonline.com); peruse fair-trade home goods at Del Sol(delsolstores.com), and Southwestern and Moroccan attire at La Mariposa (575-647-2636); and stop to refuel with Mexican food at Emilia’s on the Plaza (575-652-3007). “New Mexico is so amazing—just look up,” says Hillary McDaniel-Douglas, artistic director of Project in Motion, a Las Cruces aerial dance company. Her troupe of seven performs breathtakingly fluid and balletic aerial dance. When not touring, the artists divide their time between Indianapolis and Las Cruces, where they mesmerize us in a reclaimed cotton gin. Ongoing classes in aerial dance and trapeze await the acrobatically adventuresome. Look for PIM performances at the Depot Arts District Festival, September 14–15(www.projectinmotion.com). Las Crucens all know to head down Highway 28, “the old road” to El Paso, past adobe communities, a sweet little church, and miles of pecan orchards that are shady in September and golden in October. They stop at the village of La Mesa, where traveling foodies and locals chat while lined up for radically unrenovated Chope’s Bar and Restaurant’s cold cerveza and super-hot chile. I’m partial to eating in the small-town bar crowded with boisterous locals and NMSU students, but drinks are also served in the modest restaurant, where all who step inside are treated like family—a practice since 1915, when Lupe and Chope Benavidez first opened its doors (575-233-3420). The fun doesn’t end when the sun goes down; head to Telshor Boulevard, where De la Vega’s Pecan Grill & Brewery serves up pecan beer, pecan-smoked pork ribs, and lots of non–pecan-flavored dishes, as well as fusiony bar food from its Back Porch menu(pecangrill.com). Cozy up to an antique bar in Mesilla’s elegant Double Eagle, filled with opulent furniture and original pressed-tin ceilings (double-eagle-mesilla.com), or to more casual La Posta for a wide array of margaritas made with 50 kinds of tequila. The best places to dance are Mesilla’s El Patio Bar (575-526-9943), for rock’n’roll that caters to boisterous college students, or to divey (in a good way) Palacio’s, for salsa (575-525-2910). Come fall, as temperatures cool, local folks know what’s on the horizon. 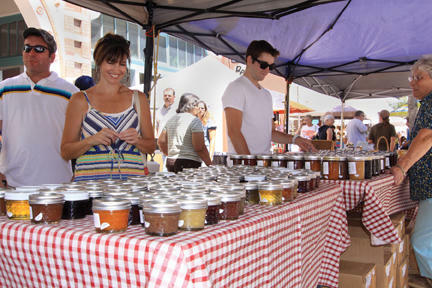 Festivities begin with the nearby Hatch Chile Festival, on Labor Day weekend (hatchchilefest.com) . 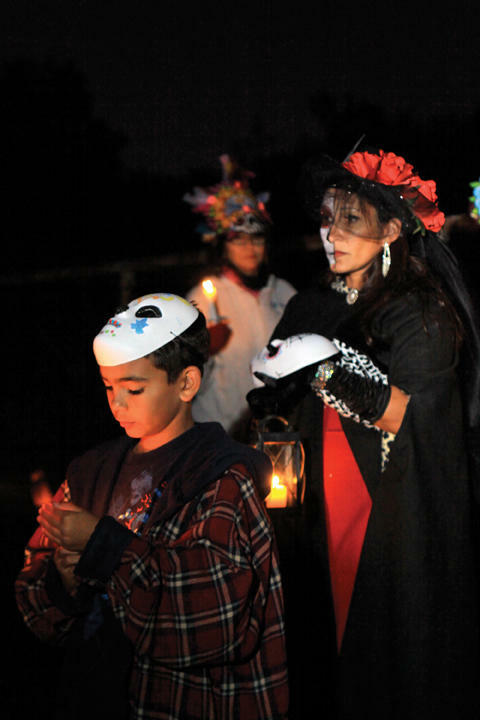 Mid-September, with the Diez y Seis de Septiembre Fiesta, Mesilla celebrates its Mexican-American heritage with a parade, ballet folklórico, piñata whacking, and dancing till midnight (oldmesilla.org) . Chef Roberto Estrada continues to construct his massive Whole Enchilada at the end of the month with scores of locals, as it’s a team effort(enchiladafiesta.com). The Southern New Mexico State Fair & Rodeo (October 3–7) has an old-time country-fair feel that delights residents of seven counties (575-524-8602). Throw in La Union’s La Viña Wine Festival in October (nmwine.com) , and the endlessly entertaining Doña Ana Arts Council’s Renaissance Arts Faire in November, in Young Park (las-cruces-arts.org) , and we’re (almost) partied out. There’s a reasonably priced course for every golfer in the City of the Crosses. New Mexico State University Golf Course is favored by those who prefer a traditional course and appreciate an abundance of shade (nmsugolf.com). Sonoma Ranch is a links course with a par 72 layout, and, like all Las Cruces courses, has patches of desert terrain among fairways and greens (sonomaranchgolf.com). Red Hawk is the newest, and locals appreciate that it uses reclaimed water to nourish its grass(golflascruces.com). All courses boast practice facilities, full bars, and restaurants. “He was known as the Burrito Man,” Josie Burrow tells me about her dad, Danny Martinez, who opened Nellie’s Café after his success with selling his wife’s homemade burritos around Las Cruces in 1962. Their no-frills restaurant has a devoted following and bears the name of Danny’s wife, who still oversees the tasty Mexican food and overwhelming selection of satisfying burritos, chimichangas, and sopaipillas stuffed with chile, beans, lettuce, and meat (575-524-9982). Locals and visitors alike find treasure in Picacho Avenue’s Antique District, at SOB’s (Sweet Old Bob’s), Things for Sale, Elegant Junque Shoppe, and Small Mall Antiques. For vibrant Talavera pottery and rustic furniture, stop by Coyote Traders, also on Picacho (lascrucescvb.com) . 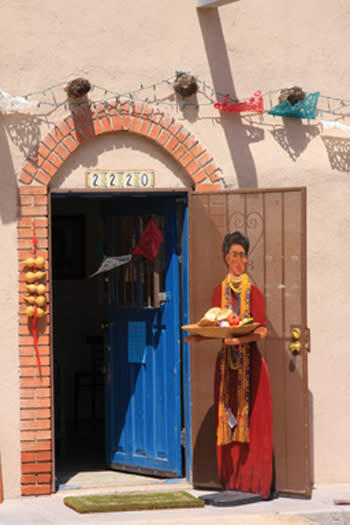 Mesilla shops, especially Galeri Azul, carry cool Frida Kahlo and Day of the Dead items (575-523-8783). For handbags, jewelry, home décor, and unique, quirky cards, check out LuLu’s(lulus.com) and Spirit Winds Coffee Bar’s Gift Source (575-521-1222). Veg heads, meat lovers, and night owls rejoiced when SB’s Late Night Lunch Box opened downtown almost two years ago. Discovered by the college crowd, the Water Street café offers an intimate venue for touring bands. Order the Green Chile Mac & Cheese, Tomato Dill’wich, or the Heart Attack Wrap (bacon and cheddar wrapped in a croissant and topped with more cheese and apple butter), and finish off with an Oreo-gasm: an Oreo baked inside a chocolate-chip cookie (412-623-9556). The one-mile trek up this turtle-shaped desert hill known as Tortugas Mountain (aka “A” Mountain) passes through native grasses, ocotillos, and fat barrel cactus, and rewards hikers with a divine 360-degree view. From my perch I gauge exactly how much Las Cruces has grown since my childhood, then face east, toward the Organ Mountains, and chart my wanderings. On December 11, Nuestra Señora de Guadalupe Corporation members welcome all respectful visitors to join them on their Tortugas Pilgrimage to honor their patron saint. Native American and Catholic traditions combine in this celebration, when Pueblo members walk up the mountain dos y dos while praying on a three-mile trip to the summit. They craft walking sticks from desert plants called quiotes, celebrate mass, share a meal, and recite the rosary, then set the mountain aglow with a bonfire and a giant cross in lights when they descend at dusk. 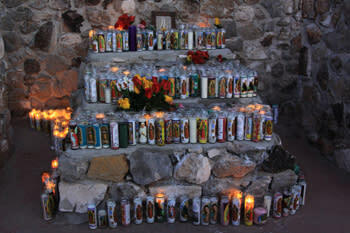 Matachine and Pueblo dances continue in the town of Tortugas on December 12, the feast day (575-526-8171). This 47-acre living museum, part of the New Mexico Department of Cultural Affairs, gives today’s generation a look at farming and ranching throughout our history, since well before New Mexico became a state. Indoor exhibitions help tell the story, but the orchards (apple, pecan, and pistachio) and livestock outside bring it alive. Throughout the day, docent-guided cart tours take visitors to the “South 20” livestock pens of dairy and beef cattle, horses, sheep, and burros. You might be able to catch a milking or blacksmithing demo. On Saturday mornings, pony rides are available for kids at an additional charge(nmfarmandranchmuseum.org). Venture away from Interstates 10 and 25 to find unique accommodations that make any trip more memorable. 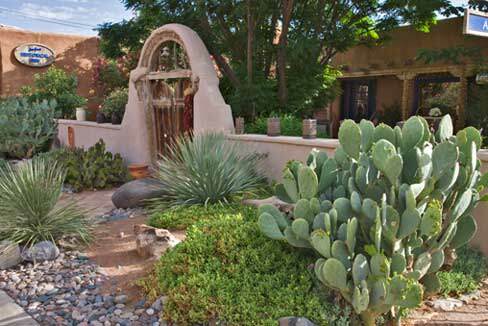 In Mesilla, fall into an elegant brass bed at Josefina’s Gate Inn, an 1850s building with 21st-century amenities. Two-foot-thick walls provide privacy to a pair of suites that share an indoor greenhouse and outdoor patio. Just steps away, guests dine on green-chile posole and fresh quiche at the café, named for the most photographed gate in the area (josefinasoldgate.com). Lundeen’s Inn of the Arts, a 20-bedroom B&B in the downtown area, also oozes with history; it’s a 100-year-old, former Mexican territorial property. Refined furnishings, 300 pieces of fine art, and lively breakfast conversation keep regulars coming back (innofthearts.com). Hotel Encanto (hotelencanto.com), one of New Mexico’s Heritage Hotels, offers the luxury of a full-service hotel, including excellent dining.